Sludge metal beasts and sons of Baton Rouge, Thou, have, with the aid of Thrill Jockey Records, pulled together a compilation release to help benefit the Greater Baton Rouge Food Bank following the floods that devastated the area in 2016. Featured are, of course, Thou along with The Body & Full of Hell, SUMAC, Yob's Mike Scheidt and Old Man Gloom to name a few. You can find a compilation trailer, some sample tracks, and information on the compilation below, all courtesy of Thrill Jockey Records. 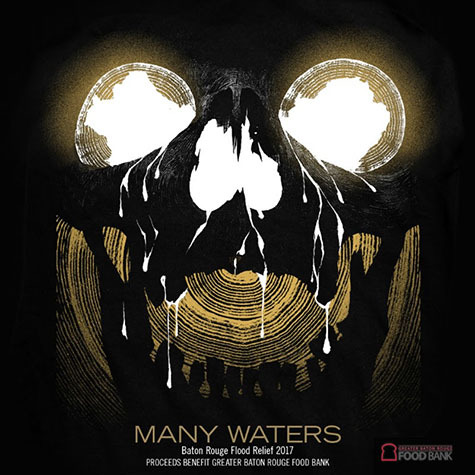 Many Waters: Baton Rouge Flood Relief 2017 is out today, with all proceeds going to the Greater Baton Rouge Food Bank for relief from the Louisiana floods of 2016. The compilation features a range of exclusive tracks from acclaimed metal acts as well as Louisiana DIY mainstays, including The Body & Full of Hell covering Devo, Thou covering Neil Young, special live tracks from SUMAC and Old Man Gloom, and a solo live recording by Mike Scheidt of Yob, as well as contributions from Louisiana bands Heavy Mantle, Dovonan Wolfington, Caddywhompus and more. The compilation is available only through Thrill Jockey or Bandcamp, with a digital booklet and the option to purchase an exclusive Many Waters t-shirt. “I spent the better part of three weeks after the [Baton Rouge] flood driving around neighborhoods looking for homes to help out. Every day after work and pretty much all day on the weekends was spent gutting damaged homes. You could tell by looking at a house, that if it didn’t have refuse and debris scattered around outside of it, it probably needed some help getting cleared out. We’d see a house without anything on the front lawn, and just go knock on the door and see if people needed help clearing things out. Once a house has had water in it for that long, all the wood gets swollen and rots and mold sets in, so you have to take it all out - sheet rock and all. A practice space we had been sharing with a slew of other bands was totally wrecked, and countless bands I know had their spaces and equipment destroyed. Certain tracks were mastered by James Plotkin, while the whole compilation features mastering donated by Keith Souza and Seth Manchester at Machines With Magnets. Artwork was donated by Becky Cloonan, renowned for her work with DC and Marvel Comics.